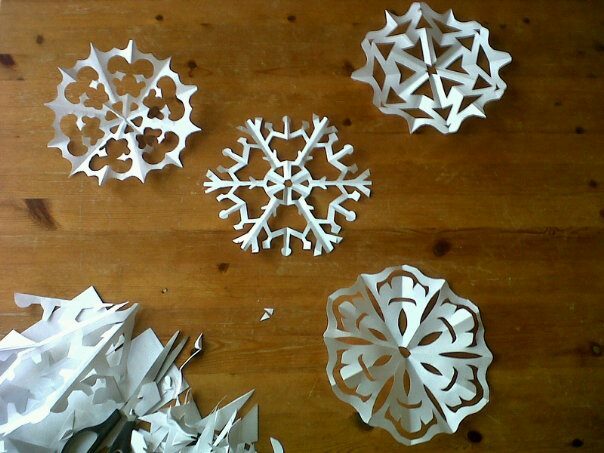 Homemade Christmas Part I: Snowflakes | Que Sera Sara? While Scotland is wild, blustery, wet and cold, there is almost never snow*. So, Homemade Christmas 2011 started with making our own. The recipe: paper, scissors and some simple geometry (don’t cringe). The most important thing in avoiding wonky flakes? Snowflakes naturally have 6 identical branches. Start by origamiing (yes, it is a word. thank you.) your paper to cut all 6 prongs at once. How do you do that? I hear you ask. Well, I could try and explain it (awkwardly at best), but may I suggest you use Vintage Junky’s lovely template until you get the hang of the proportions? There are also more patterns here but I figure, once you’ve got the method down, why not freestyle like a pro? Who knows what awesomeness you will create? * Yes, almost never with the snow in Edinburgh. We’ll maybe get a couple inches a year. Last year we had a week of really strong snowfall( like a metre deep). Everyone FREAKED out. The world literally stopped turning in these parts. And the government ran out of road salt and had to have a literal boat load shipped from Peru. As in an actual boat came into harbor with it one day.